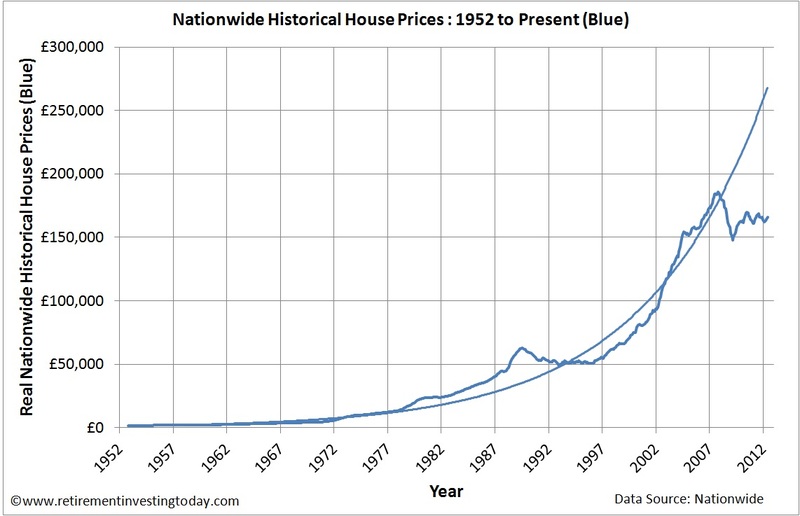 For a long time I’ve been saying that houses are overpriced. This statement keeps my family in rented accommodation as I refuse to buy at these prices. So while in recent years there has been some nominal reduction in prices, reversion to a sensible mean value stalled in 2009. This was further reinforced last week when the Nationwide informed us that month on month house prices had increased by 1.1% and year on year had fallen by a negligible 0.7%. 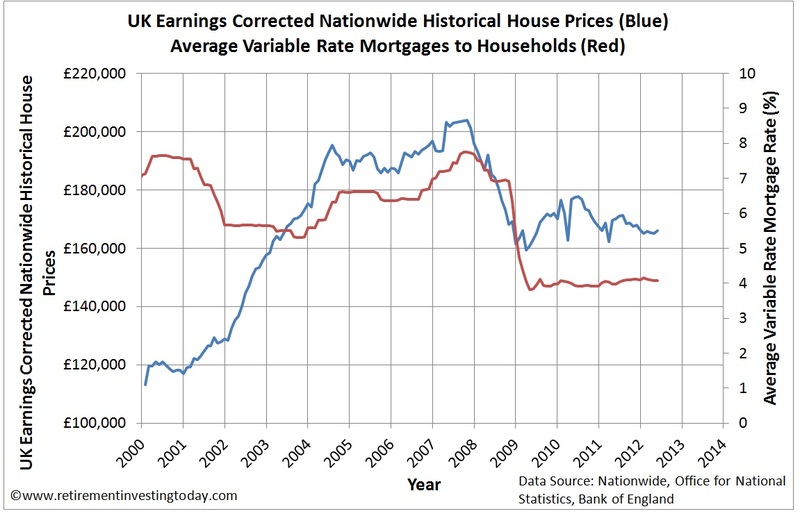 So about now I would normally start to correct the Nationwide House Price Index to account for the devaluation of money through inflation and ratio this with average persons earnings. I would then come to the same conclusion that I always do. 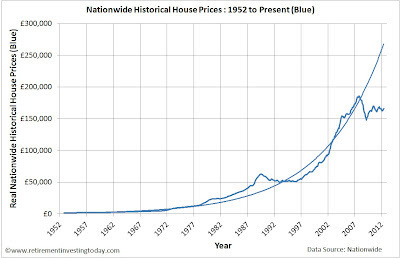 House prices are overvalued when compared to the long run average. I’m now starting to think that I am going about this the wrong way. The average person on the street does not analyse data and look at what house prices should be. The average person on the street instead knows the price of everything and the value of nothing. Instead, I’m starting to come to the realisation that what is driving this market is not house prices but simply house affordability. Not how much is this house worth, but instead can I today (no thinking of future interest rates) borrow enough money to buy this over priced piece of bricks and mortar. Firstly, let’s look at how much the average person earns. Even though inflation is outpacing salaries we are still seeing some increase in the average person’s salaries. 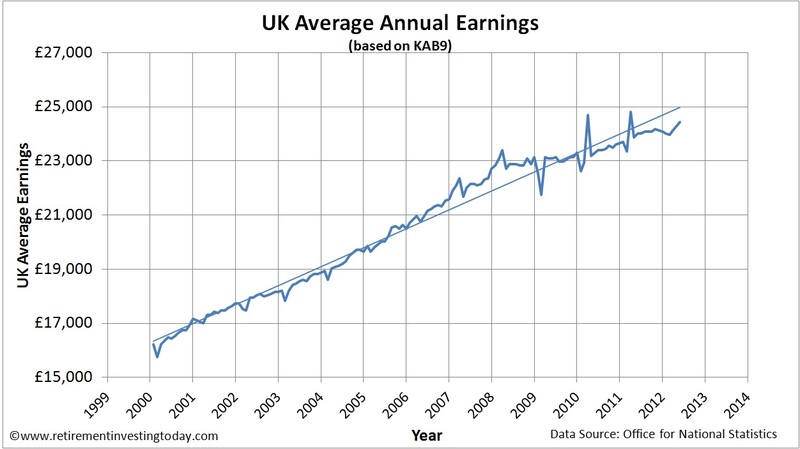 This is shown in my second chart which shows the change in UK Average Annual Earnings. 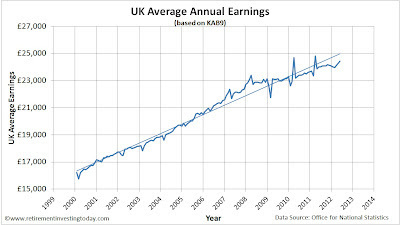 I have calculated this from the KAB9 dataset, courtesy of the Office of National Statistics, which is the seasonally adjusted average weekly earnings including bonuses. As the chart shows, as of March 2012 this is £24,128 which is up from £16,224 in January 2000. 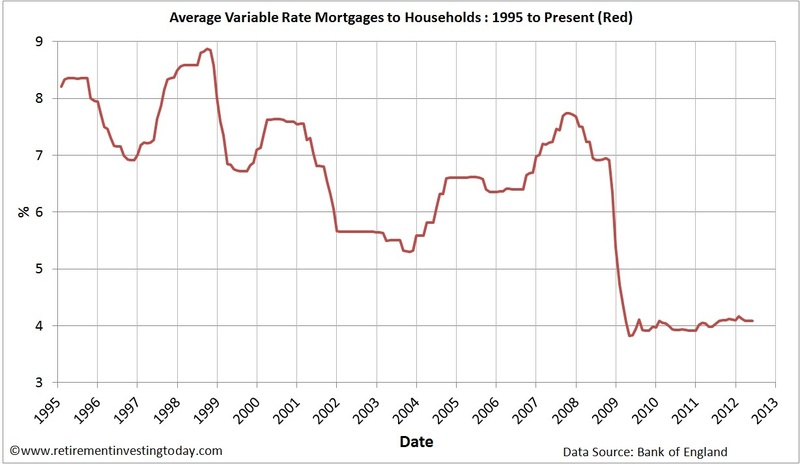 Secondly, let’s look at average interest rates. We all know the Bank of England collapsed the Bank of England Rate to 0.5% however this is of no relevance to the average person on the street. They are worried about how much a bank will lend them. To get an idea of this I am going to turn to the Bank of England statistic known as IUMTLMV which is the monthly interest rate of UK resident banks and building societies sterling standard variable rate mortgage to households (not seasonally adjusted). 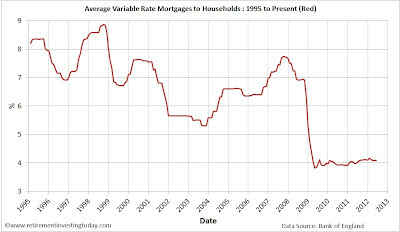 This is shown in my third chart, which shows that as of April 2012 the rate is 4.08% down from 7.74% in October 2007. 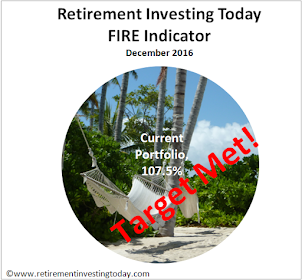 My fourth chart today incorporates these two drivers into one simple chart. 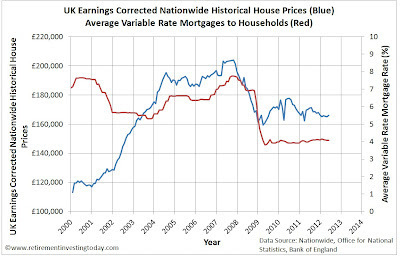 Firstly, I correct Nationwide House Prices by the change in earnings and secondly, I plot interest rates alongside. An average person bought at the peak earnings corrected price. This was £203,824 in October 2007. At this time the mortgage rate was also at a peak of 7.74%. To make the maths easy let’s assume a 100% of house price mortgage (the actual percentage doesn’t actually matter for the purposes of this post) and a 20 year repayment period. Plugging these numbers into a Mortgage Calculator (http://www.bbc.co.uk/homes/property/mortgagecalculator.shtml ) we arrive at annual repayment (principle + interest) of £20,360. The average person still bought at the peak earnings corrected price but has now seen mortgage rates drop to today’s 4.08% with all other variables staying the same. Plugging back into the calculator we see repayments have now lowered to £15,104 or a 26% reduction. Finally, a new average person buys at today’s average Nationwide House Price of £166,022 with a mortgage rate at today’s rate of 4.08% with all other variables staying the same. Plugging back into the calculator we see repayment have now lowered to £12,302 or a 40% reduction compared to peak. So UK houses are between 26% and 40% cheaper than peak meaning even if you stretched yourself in 2007 you would have some breathing space today. Plus, if you buy the average today with the average it is far more affordable than peak. Of course, this analysis is a simplistic analysis of a very complex problem. It doesn’t account for many things but does give us a small indication of average house affordability in the UK. 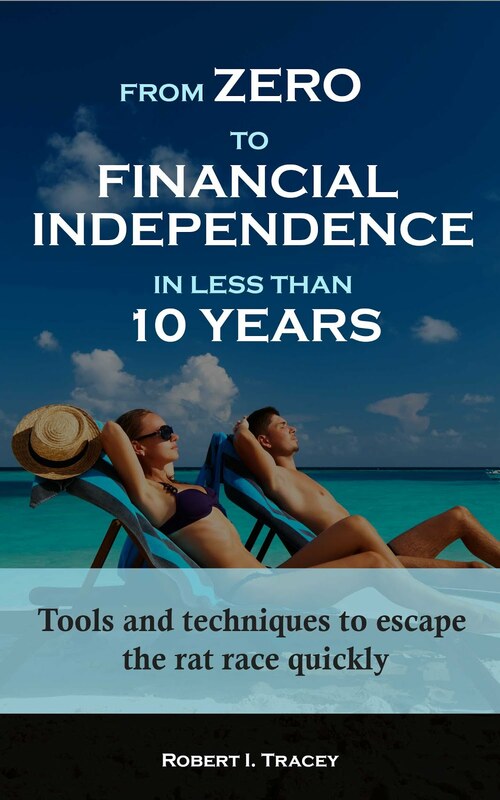 You are simply struggling to make your mortgage payments for any number of reasons. Maybe the governments Mortgage Rescue Scheme would come to your rescue. Earnings increase. Even if earnings increase at a rate slower than inflation house prices will become more affordable if prices stay constant. They could even increase at the rate of earnings and maintain affordability. Under this scenario I can’t see how prices will fall. Earnings decrease. In the current environment I can see employers holding wages constant (ie allowing inflation to devalue wages in real terms) but can’t see them cutting enough salaries to make a difference. It’s just doesn’t seem as bad as 2007 today. Governments and those in power seem to be just about walking the tightrope while continually kicking the can down the road. Of course, you could lose your job. However then you would use savings, if any, to pay the mortgage until such time as the government possibly comes to your rescue in the form of Support for Mortgage Interest. Interest rates decrease. Well this one’s obvious. No house price falls. They could even rise. Interest rates increase. Now we are getting somewhere. If interest rates increase house price affordability must fall. Of course, some people will always be forced to sell or be repossessed but with what I have presented above it could simply be a small number. So until interest rates start to increase I can’t see how we will see house prices begin to revert to mean from where we are today. Deliberately controversial I know. Hopefully this will stir up some debate amongst readers. In the meantime I still am not planning on entering the housing market and remain in rented accommodation. Re 2007 affordability, people could not afford that much, it was largely due to liar loans and the potential to make a fast buck selling again or MEW. It's all about lending not affordability. If banks lend people will borrow whether they can afford or not. So savers via low interest rates are paying the mortgages of people buying, to save the banks from losses and enable them to keep taking bonuses. Even if it was due to liar loans, fast buck grabbing or MEW the data says that if they still hold the property today it is 26% cheaper to keep it than it was. Very much agree with whatever a bank will lend people will borrow. A year or two ago I reached the conclusion that affordability is all that really matters -- in terms of monthly payments, and with not a whiff of an idea about money illusion or similar clouding anyone's judgement. Even two years ago I might have still held a candle for credit availability being a factor in house prices, but that barely seems true, too. Your posts are always top class and so I very much look forward to seeing your take on things. Steady downward pressure on prices will be exerted for some years owing to failing endowment backed mortgages. I think this will keep the lid on property inflation and, in consequence, affordability may well improve further. Some good information. I hadn't really thought of the effect of endowment mortgages. How do you think it will put pressure on prices as it hasn't immediately clicked for me? I'm assuming you're thinking that a person will look to move and find they owe a lot more on their mortgage than they thought meaning they'll be able to afford to pay less for the next one (whether downsizing to extract a "pension" or upsizing). This will then also be combined with monthly payments for a non endowment mortgage being higher for the same sized property meaning people will expect lower prices resulting in similar monthly payments. PS Are you planning to start blogging again soon as I used to enjoy your posts? RIT, yes, I'm just thinking of the consequences of a non-performing endowment. Suppose someone bought a house 20 years ago for £100k and in 5 years from now (after perhaps further decline) when the endowment pays up it's worth £250k. The endowment payoff is only £50k, however, and the owner has no extra funds and is close to retirement (cannot remortgage). A forced sale ensues and the owner gets £150k for the next house. It seems to me a constant flow of these cases over the next ten years, coupled with rises in rates will cause further real declines in prices. P.S. Will probably keep blogging, but not with any specific frequency.